Think anime is all mechas or outer space bounty hunters or weird jokes you won’t get or Tokyo getting exploded? Think anime isn’t for you? think again. Take Alexandre Dumas’ The Count of Monte Cristo, and put it far in the future. A future where a walled Paris is one of the few habitable places left on Earth and the moon has been fully colonized. A future where the rich marry for political reasons and machinations and everyone else just tries to get by as best they can. A future where the more things change, the more they stay the same. Loosely following the original material, yet told from the point of view of the overly naive Albert, Gankustuou: The Count of Monte Cristo is as visually stunning as it is fascinating. 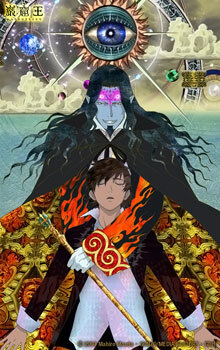 This is an anime that you want to watch because it is well written, well voiced, and simply beautiful to behold. The fact that you’ll be digging around for old Dumas titles afterwards is just an added bonus. An oversimplified summary of the original story goes thusly: shortly before the sailor Edmond Dantes is to marry Mercedes, he is betrayed by Fernand, a rival for Mercedes. Dantes is imprisoned in the Chateau d’If, and Fernand marries Mercedes. During his imprisonment, Dantes befriends a fellow prisoner who claims to know of a buried treasure. When Dantes escapes the Chateau, he finds the treasure, and returns to Paris. It’s been 15 years, and Mercedes and Fernand have a son, named Albert. Introducing himself as the Count of Monte Cristo, Dantes plans his revenge on the man who destroyed his life, a slow revenge that is as beautiful as it is brutal.